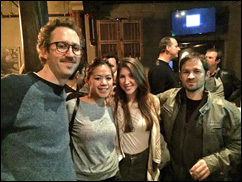 SAN FRANCISCO (Hypebot) – Last night, San Francisco confirmed what Hypebot already knew – there is a vibrant community of music tech professionals in the Bay Area seeking the opportunity to network and grow together. How are we so sure? We met them last night! Music tech professionals poured off of Polk Street and into Bitters, Bock & Rye yesterday evening for Hypebot’s first official San Francisco Music Tech meetup. With representation from industry leaders such as Apple, Google, Pandora, InGrooves, Empire Music, SF Music Tech, Bandpage, SoundHound, and many more, there was no shortage of combined music industry knowledge and experience to be expanded on. Each person brought something unique to the gathering, making it a tremendously successful networking event. The 75+ attendees kept the conversation moving from 7-10pm and went separate ways looking ahead to the next meetup. Co-hosts Kyle Bylin (SoundHound) & Laura Schneider (Hypebot) look forward to growing the event and an hosting others in the near future. Subscribe to Hypebot.com for the latest music news & updates on future meetups!